Netlfix is a darling. Their customers love them, and so does Wall Street. In the last five years, their stock has more than doubled, while the S&P 500 has gone nowhere. But let's face it - Netflix should not have succeeded - Blockbuster should have. Blockbuster had every advantage - they had the relationships, the cash and the marketing budget. 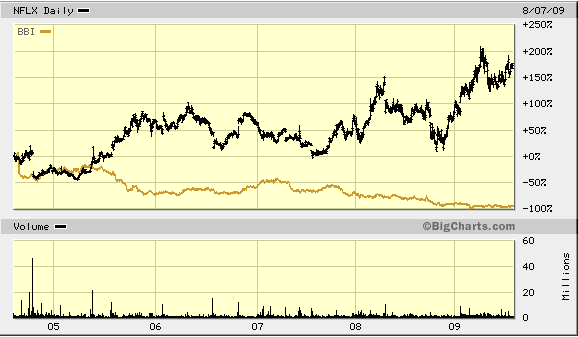 However, while Netflix has doubled, Blockbuster stock is worth less than 1/10th of what it was worth just 5 years ago. How did Netflix win. After reviewing the presentation below, I'm more convinced than ever that Netflix won because of the culture they have built on purpose. The culture presentation has 128 pages to it, but every one is worth reviewing. Innovation is important. Strategy is critical. Tactics matter. But give me the culture that allows great people to be great and expels people who aren't - and I have no worries.